The New Milan Reference 10 Audio Visual Support Furniture Range have been introduced by Custom Design as a result of our customers requests. Customers perceptions of Audio Visual furniture have changed, design is important, contemporary more than accessory. That is why the New Milan Reference 10 Plasma 3 Support Furniture Range have been designed as a piece of furniture. Then with the 25 years of experience and knowledge the details added to enhance the Milan Reference 10 Plasma 3 Support Range acoustically to the highest standards without compromise. Custom Design sources all cardboard packaging from only PEFC or FSC certified companies. 76% of the cardboard packaging has been manufactured from recycled material which can be 100% recycled. 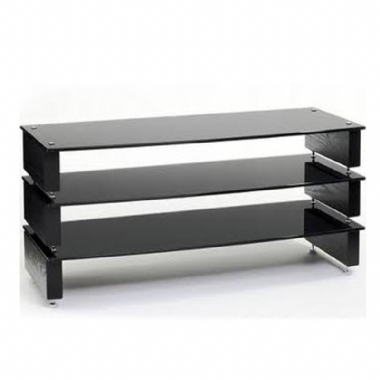 The 10mm glass shelves are manufactured to EN 12105-02, toughened with polished edges and available in Clear or Black finish The hardwood and glass shelves can support 50kg per shelf.